The Rhodesian Ridgeback is presently the only registered breed indigenous to Southern Africa. It’s forebears can be traced to the Cape Colony of Southern Africa where they crossed with the early pioneers’ dogs and the semi-domesticated, ridged Hottentot hunting dogs. Hunting mainly in groups of two or three, the original function of the Rhodesian Ridgeback or Lion dog was to track game, especially Lion, and, with great agility, keep it at bay until the arrival of the hunter. The Rhodesian Ridgeback originated in Southern Africa where the early European settlers mated their sporting breeds with the small, fierce, hunting dogs, owned by the Hottentots, in order to produce a guard/hunting dog ideally suited to the local conditions. The Hottentot Hunting Dog had a ridge of hair along it’s spine running in a reverse direction to the rest of the coat; the historian, George McCall Theal, was the first to describe this characteristic when writing on conditions in Southern Africa before 1505. Possibly the only existing illustration of Hottentot dogs, which actually shows ridges on their backs, in to be found in Dr David Livingstone’s book, “Livingstone’s Missionary Travel in Southern Africa”, published in 1857. There is no way of knowing for certain which of the European breeds do feature in the background of the Rhodesian Ridgeback. 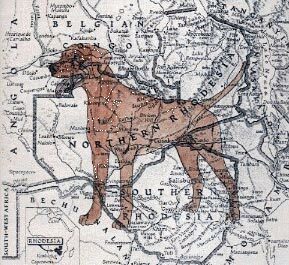 The breeds that have been recorded as being in Southern Africa during the 1860’s and 1870’s are Bloodhounds, Deerhounds, Greyhounds, Bulldogs (much longer in leg than today), various Terriers, Mastiffs, Pointers (possibly responsible for the brown nose) and, occasionally Foxhounds. The ridge of the Hottentot Hunting Dog became a feature of the cross matings between the European breeds and the indigenous dogs. These “Ridgebacks” were used as functional, all purpose, guard and hunting dogs and it was found that they surpassed any other breed when hunting lions. “Ridgebacks” were not expected to kill lions – no dog could do that as a lion is an extremely powerful and heavy big cat standing about .95m at the shoulder. The “Ridgeback” would track the lion and bail it up enabling the hunter to come in and shoot it; this required intelligence, cunning and tremendous athleticism and agility on the part of the dogs. “Ridgebacks” were, however, expected to chase, catch and pull down lesser game and would kill a lion cub without hesitation. The first recorded pair of ridged dogs to go from South Africa to central Africa (then Rhodesia, now Zimbabwe) were taken by the Rev. Charles Helm in 1879 to Hope Fountain Mission (near what is now Bulawayo), probably from Swellandam, Cape Colony. During the late 19th Century, the reputation of “Ridgebacks” in the hunting field became established by the exploits of these dogs. Van Rooyen’s dogs were very similar to today’s Rhodesian Ridgebacks. By the 1920’s, when the days of big game hunting on a grand scale were drawing to a close, it became apparent that “Ridgebacks” might disappear if the breeds were not standardised and breeders encouraged to strive to conform. The standard of the breed, which borrowed much from the Dalmatian Standard, was drawn up by a Mr F.R. Barnes after he called a meeting of “Ridgeback” owners in Bulawayo in 1922. This Standard was accepted by the South African Kennel Union (now the Kennel Union of Southern Africa) in 1924. Prepared by The National Rhodesian Ridgeback Council of Australia (NRRC) with references from Hawley, Hutchison’s Dog Encyclopaedia, “The Rhodesian Ridgeback 1924-1974” – author Janet Murray. The Breed Standard describes the perfect Rhodesian Ridgeback. In the show ring, judges are looking for the dog which best fits this description. Reputable breeders aim to produce puppies which fit this description as closely as possible. Puppies, which vary from this standard, may be offered to pet homes ie. non-showing non-breeding. When purchasing a pet, ask the breeder to explain why the pup is not of show quality, so you can make an informed decision! Keep in mind that these puppies have had the same vet care, expense and attention from the breeders as a show quality pup. We ask that all unregistered puppies are desexed and under NO circumstances should these be bred from. Despite thorough checking by both the breeder and veterinarian there is a possibility that puppies may unexpectedly develop a fault at a later date. You need to discuss this possibility with the breeder and agree upon what steps are to be taken if such a situation develops.